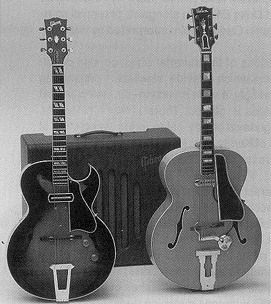 The earliest jazz guitars were archtop acoustics. These were fitted with electronics that still exist to this day in either of two configurations: with built-in pickups or with floating pickups. 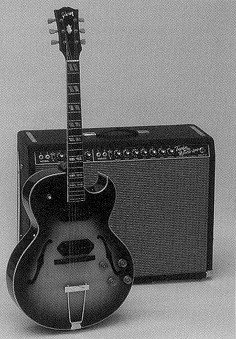 Pictured above and illustrated of the two are an ES-175 with the famous "Charlie Christian" bar pickup and a 1940 Gibson L-5 with a floating DeArmond Rhythm Chief system. Notable players of the bar pickup include Charlie Christian, Oscar Moore, Tal Farlow, Jimmy Raney, Barney Kessel, Hank Garland, and bluesman T-Bone Walker. 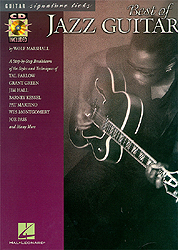 Players who have used floating pickups include Kenny Burrel, George Benson, Johnny Smith, and Pat Martino. In the background is a mint-condition 1652 Gibson GA-75 with a 15-inch Jensen speaker -- the top-of-the-line of the GA amp series. 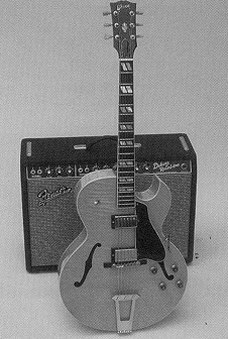 The GA models were the paragon of 1950s jazz tone and associated with numerous jazz guitarists such as Tal Farlow, Howard Roberts, Barney Kessel, and Jim Hall.